Time to meet the Jaegers! After kicking off a rather exciting set of viral images and videos for Guillermo del Toro's monsters vs robots movie Pacific Rim, a few extra goodies have arrived to keep our interests piqued for now. During the reveals yesterday, there was a giant blueprint poster of one of the human-controlled Jaeger robots that we see fighting the giant monsters (seen attacking in this news video) in the movie. 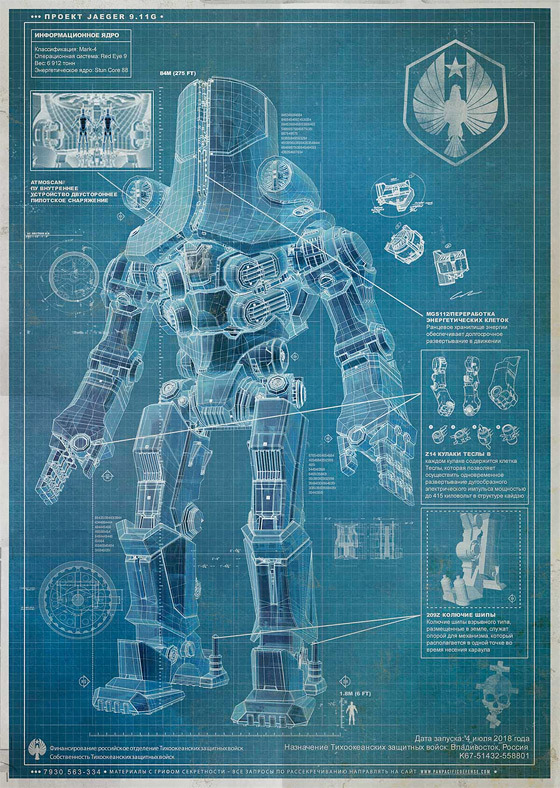 A number of websites around the world have been slowly revealing more blueprints of the giant bots one at a time, and now we have three more showing other international Jaegers for us to meet. There's also a tease in the first Russian design about the two-human control system that we'll plenty of in the movie. Take a look! 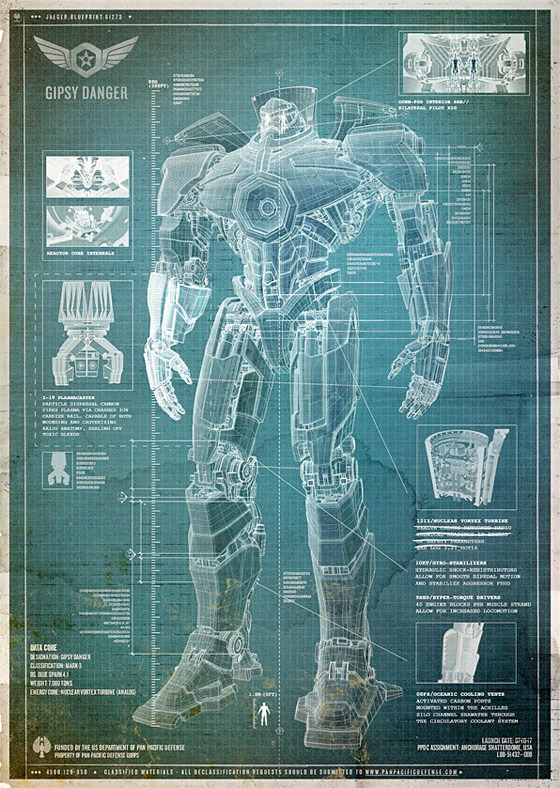 Here's the full blueprint poster for the Russian Jaeger called Cherno Alpha, found on ComicBookMovie. 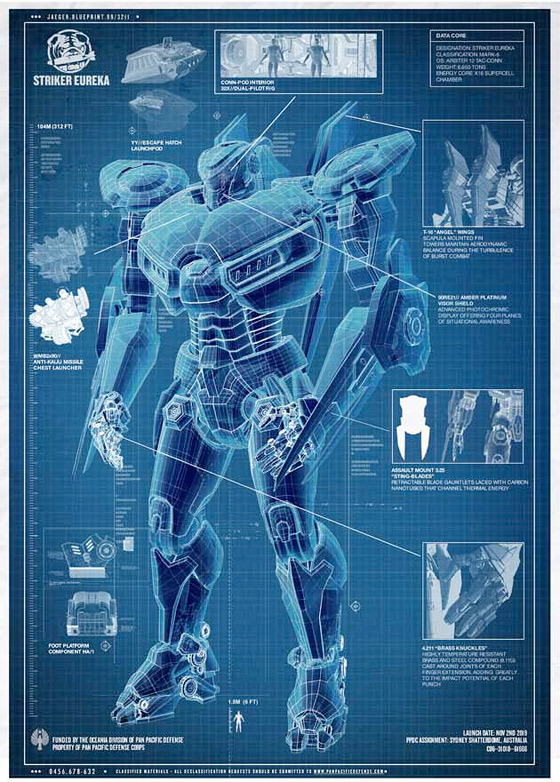 Here's another new blueprint for the Jaeger named Striker Eureka. This guy looks like a total badass. Finally, here's the Japanese Jaegar called Coyote Tango, who also looks pretty mean. Found via Eiga. 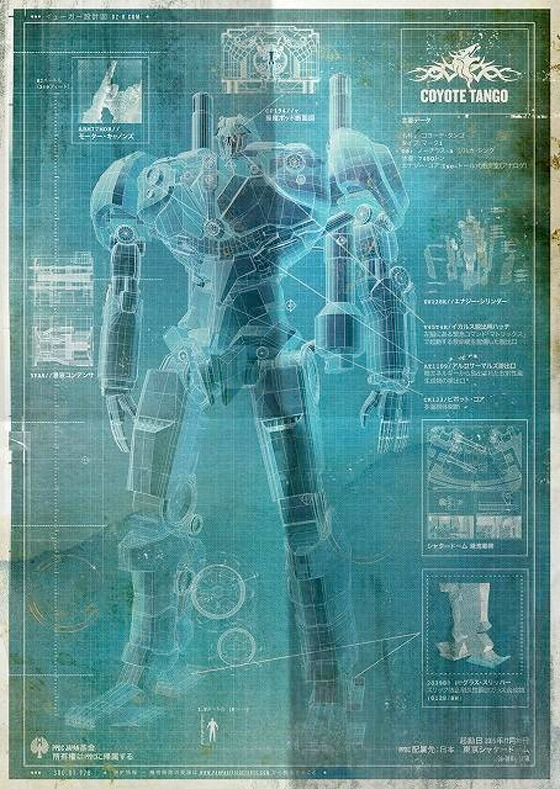 Also, just for reference again, here's the first Gipsy Danger Jaeger robot revealed yesterday with the viral. Those are the latest updates, with that YouTube "Breaking News" video being the most exciting thing to arrive yet. We'll keep an eye out for more updates from the Pan Pacific Defense Corps regarding Pacific Rim. Guillermo del Toro (Hellboy, Pan's Labyrinth) is directing Pacific Rim from a script by Travis Beacham. The film follows a washed up former pilot (Charlie Hunnam) and an untested trainee (Rinko Kikuchi), who are teamed to drive a legendary but seemingly obsolete Jaeger, a massive robot designed to fight legions of monstrous creatures known as Kaiju, which started rising from the sea years ago. They stand as mankind's last hope against the mounting apocalypse. The film also stars Idris Elba, Ron Perlman, Charlie Day and Clifton Collins Jr. and Warner Bros. sends the film to theaters everywhere on July 12th, 2013. Stay tuned. We posted him in the viral update from yesterday. He was added there: https://www.firstshowing.net/2012/pacific-rim-viral-fires-up-with-kaiju-alert-system-test-countdown/ There are currently four in total, but these are the three newest ones from today. Can someone help me find the excitement in Pacific Rim. Yes Del Toro is awesome, but to me just looking like Transformers vs. monsters. Help me believe! Transformers vs monsters? You have a problem with that? That sounds like something I watch over and over. In the hands of a director that is exponentially better than Micheal Bay. "Transformers vs monsters"...nah, sounds to limiting. It's Del Toro, and he's doing something cool, and that man does not use the cookie cutter. The question this movie will have to answer is: Why build these robots to fight giant sea monsters? Seems like the society that would have the technology to build these robots (and allow two people to "mind-meld" and drive them) would be able to come up with much better ideas. Like bigger guns. It's a valid point. In this http://www.youtube.com/watch?feature=player_embedded&v=mS6kk1bTqJs you have mention of one 'brought down by a barrage of missiles', so why bother going to such expensive extremes as giant robots? Exactly...seems a bit juvenile. Based on the premise I'd expect it to be a kid's movie. Don't over-think it. It's a movie. Besides, sure the robots would be impractical and nearly impossible to build...but who cares? I'm sure there will be an explanation for why they had to build them. We'll see when the film comes out. I just "repeat to myself it's just a show. I should really just relax..." "for Mystery Science Theater Three-thou-suuuhhnddd!" could just be that they want to make a fun movie. Not everything needs to be realistic or explained. Its a fantasy. Really like Gundam designs. I like em though, they look a lot more like mecha robots than what the concept art guys have been coming up with for recent movies. This will be the blockbuster of all blockbusters.